I wrote this in the early hours of this morning while I thought about all the things following Jesus can mean. Often I think it means comfort, love and only good things all the days of my life. But when I look at the doubts, the hard experiences and the failures of the first people Jesus called to follow him, I'm reminded that the real beauty of the phrase lies in the truth that Jesus invites me to journey through the doubts, the hard experiences and failures with him. They put down fishing nets. 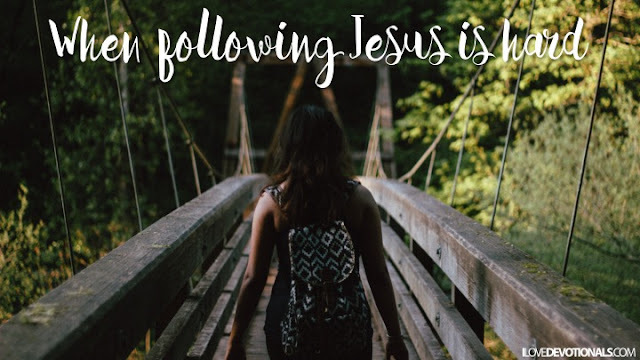 "Come, follow me," Jesus said. They walked in his footsteps from place to place. They handed out food to 5000 people. They hid from the crowds with him on a boat. They saw Jesus walking on water. Peter stepped out of the boat to walk on water like his savior. When he lost faith Jesus caught him and kept his head above water. They walked to the garden of Gethsemane. They fell asleep while Jesus prayed. And they leaped to his defense when one of his own betrayed him. You followed him! Not me! Three times Peter denied trailing the one who called him his rock. They walked behind him up the Calvary hill. They followed him through the valley of the shadow of death. They heard him cry, "my god, my god, why have you forsaken me" and then breathe his last. They heard his voice again after thinking they would never see him again. 3 days and nights his body lay in the tomb. But he lives. Come, follow me to my father's house.